A police officer in Dover, Delaware, who was charged with assault for kicking a black suspect in the head, was acquitted of charges, according to reports on Tuesday. Dover officer Thomas Webster IV, 42, was acquitted by a jury of felony and misdemeanor assault. He was accused of breaking the jaw of Lateef Dickerson, 29, according to the New York Daily News. A grand jury indicted Webster in May before the release of dashcam footage that shows him kicking Dickerson in the head, breaking his jaw and knocking him out. 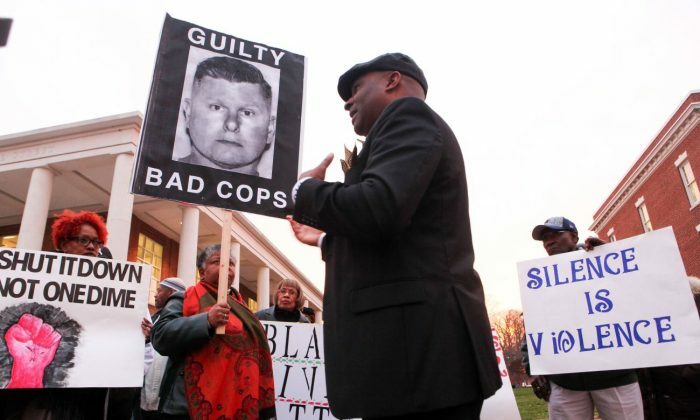 The verdict made some community members angry, who gathered outside the courthouse on Tuesday. Webster said that he was attempting to kick Dickerson in the upper body, rather than in the head. He was told Dickerson had a gun on his person after he fled from the scene of a brawl and ignored the officer’s commands to get on the ground, defense attorney James Liguori said. “These split-second decisions and judgments … not only were they justifiable, they were, in fact, necessary,” Liguori said, per the Daily News. “I don’t have a response to this because it’s beyond belief,” Gunn told the News Journal. “I don’t know how a jury in this community, 12 people, can reach that decision. Prosecutors said Webster was trying to kick Dickerson in the head.